Bruce Brown Jr. played in just 19 games for the Miami Hurricanes this season due to a left foot injury that required surgery. CORAL GABLES, Fla. (AP) — Miami Hurricanes sophomore guard Bruce Brown Jr. has decided to declare for the NBA draft but won’t retain an agent, leaving him the option of continuing his college career. The school announced Brown’s decision Thursday. Players have until April 22 to enter the draft and until June 11 to withdraw. The draft is June 21. Brown is considered a potential first-round pick even though he had a disappointing season that ended after 19 games because of a left foot injury requiring surgery. He averaged 11.4 points and shot 27 percent from 3-point range. Freshman guard Lonnie Walker IV also is considering turning pro this year and is projected as a potential lottery pick. 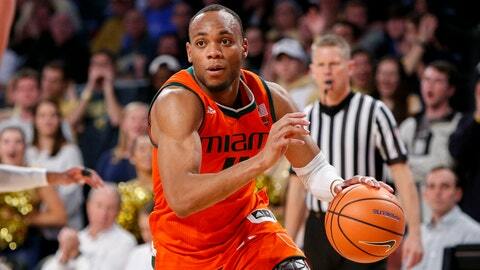 The Hurricanes lost to Loyola of Chicago in the first round of the NCAA Tournament and finished 22-10.